Summit County in northeastern Ohio has found a new home in one of its oldest buildings. In its heyday, the historic Firestone shipping and warehouse facility, or “Triangle Building,” in Akron serviced one of the largest tire manufacturers in the world. Philadelphia-based private real estate and development company Amerimar Realty Company renovated and repurposed the Triangle Building with the help of federal and state historic tax credits (HTCs), making the historic building a one-stop shop for Summit County services. Before moving into the Firestone Building, Summit County occupied four separate locations downtown that served up to 8,000 clients per month, but had no public parking. The lack of accessibility prompted the county to evaluate other potential locations for its services. Summit County issued a request for proposal and eventually decided on the Firestone site, a place where it can offer services from multiple departments under one roof. The historic Firestone shipping and warehouse facility in Akron, Ohio, was renovated into office space for Summit County services. Firestone built the four-story shipping and warehouse facility in 1926 to service its adjacent 1 million-square-foot tire manufacturing plant. The massive depot was large enough to have freight trains drive through it. When Firestone merged with Bridgestone in 1992, it moved its headquarters from Akron to Nashville. As a result, the Triangle Building was relegated as a parking garage for the company’s few employees who remained in Akron. Amerimar decided to purchase and renovate the Triangle Building with the goal of landing Summit County as its long-term tenant. First, several major updates were needed to make the building suitable for office use. Private offices are grouped toward the center of the building, while desks and cubicles line the windows to take advantage of the ample daylight through the large industrial windows. The structural strength of the building was also a good fit for the county’s needs. “Built as a factory, the floors can take a lot of weight,” said Sutter. “Filing and storage on upper floors is not an issue at all.” Updates include new mechanical systems, electrical systems, a modern HVAC system and elevators. The historic Firestone building in Akron, Ohio, is now home to Summit County services. Many of the building’s historic features were preserved. A tall entry bay that was once the opening for train cars was repurposed into a loading dock. The historic stairs, hand rails, concrete floors, columns and brickwork were also saved. A historic parapet that had been covered in metal was restored to expose the original stone edging. A series of smaller garage doors along the south side of the building was beyond saving, so windows were installed to look like garage doors. Murphy said parts of the brick structure had deteriorated to the point that, if renovation had not begun immediately, the structure would have failed. The development team tried eight different brick mock-up types to use in the repair, but couldn’t find an exact replica. Luckily, they didn’t have to recreate the bricks after all. In a field about a half-mile from the property, a superintendent discovered a pile of historic bricks that matched the ones used in the Firestone factory. Another challenge was finding 500 modern windows that closely replicated the aesthetics of the original steel factory windows. The solution was to use aluminum windows that were energy- and cost-effective, but still preserved the appearance of the original windows. “Getting the windows right was critical for the historic tax credits,” said Loveman. 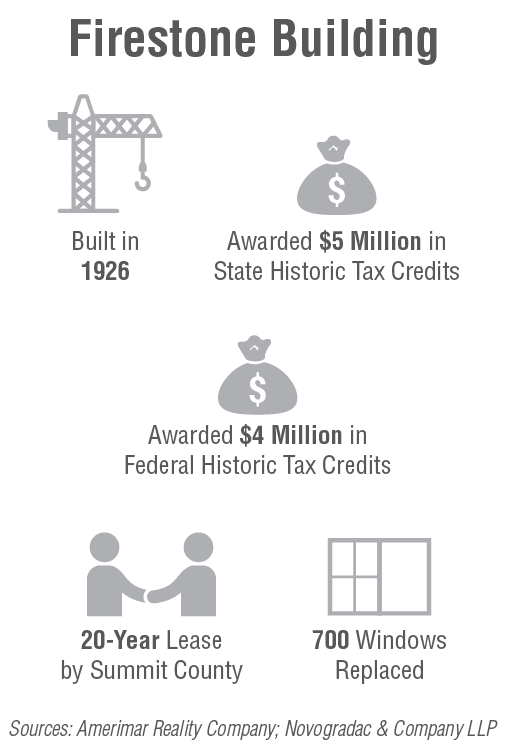 The combination of federal and state HTCs was instrumental in making the redevelopment feasible. “Tax credits are an absolutely critical component, especially because the local office market doesn’t support the cost of renovations,” said Loveman. In order to qualify for the state HTC, Amerimar worked with the city to have the Firestone campus locally registered as a historic district. Amerimar then submitted the county’s letter of intent to lease and the lender’s financing term sheet. Only then did the Ohio State Historic Preservation Office award the property $5 million in state HTCs and $4 million in federal HTCs. Amerimar kept the credits for its own use.